660 total cards. Series 1 is #1-330, Series 2 is #331-660. Spread across two series, 2009 Topps Baseball is a 660-card set. A pair of Davids make up the two best base cards. 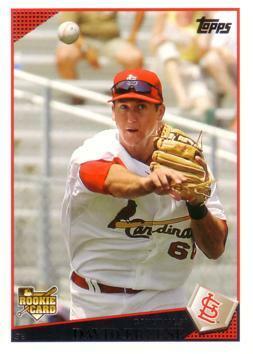 David Freese and David Price both have rookie cards in the set. Even then, Price doesn't bring in big dollars in large part because he had several prospect cards in earlier Bowman sets. But at this point, the flagship Topps set doesn't revolve around key rookie cards. It's aimed at largely at set builders and those looking for an affordable mix of inserts. 2009 Topps Baseball hits on both fronts. Base cards have a large player photo. Although not all of the shots work, there is more creativity than in the previous couple of years. The top-left and bottom-right corners are highlighted by small foil squares. The name plate is a diagonal bar at the bottom of the card. It has the player's name, team and position all written in silver foil. A home plate with the team's logo hovers over top of the name plate. Base set parallels in 2009 Topps Baseball include Gold (#/2009), Black (#/58), Printing Plates and Platinum (1/1). Walmart and Target blasters also had exclusive parallels. Walmart All-Black cards have a black border. The background on the card is also darker than normal. Target Throwbacks have a retro Topps logo. Silk Collection cards are a partial parallel. Each of the framed mini cards are numbered to 50. One of the big draws of 2009 Topps Baseball was the short print variations. Both Series 1 and Series 2 paired 17 legends and Hall of Famers with similarly styled veterans. 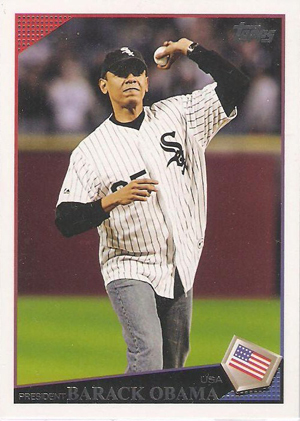 2009 Topps Series 1 Baseball also had variations featuring Barack Obama throwing out the first pitch at a White Sox game and C.C. Sabathia in a Yankees uniform. Between both series, 2009 Topps Baseball has 36 short print variations. Several insert sets ran throughout each of the flagship 2009 Topps releases. These include Turkey Red, Legends of the Game, Ticket to Toppstown and Ring of Honor. The first 50 cards in Ring of Honor were distributed in conjunction with 2009 Series 1 Baseball, but in two different formats. Odd numbers were inserted in packs. Even numbers were available in special five-card packs given out at participating hobby shops. Ring of Honor cards 51 to 75 were included in 2009 Topps Series 2 Baseball packs. 2009 Topps Baseball had two redemption programs. Random Series 1 packs had a program for World Baseball Classic cards. The WBC Rising Stars set has the first Topps Yu Darvish card. Series 2 had the Red Hot Rookie program. The highlight of that set is Gordon Beckham. Ten percent of his cards came autographed. Most of the autographs and memorabilia cards in 2009 Topps Baseball were based on existing inserts within the set. These include Ring of Honor and Career Best. The design is cool, but the photos are frequently off-centered and contains lots of errors. Mike M � “Cereal” is the name of the insert. 2009 Topps Series 2 Baseball Jumbo Box - Factory Sealed! 2009 Topps Series 2 Baseball Hobby Box - Factory Sealed!